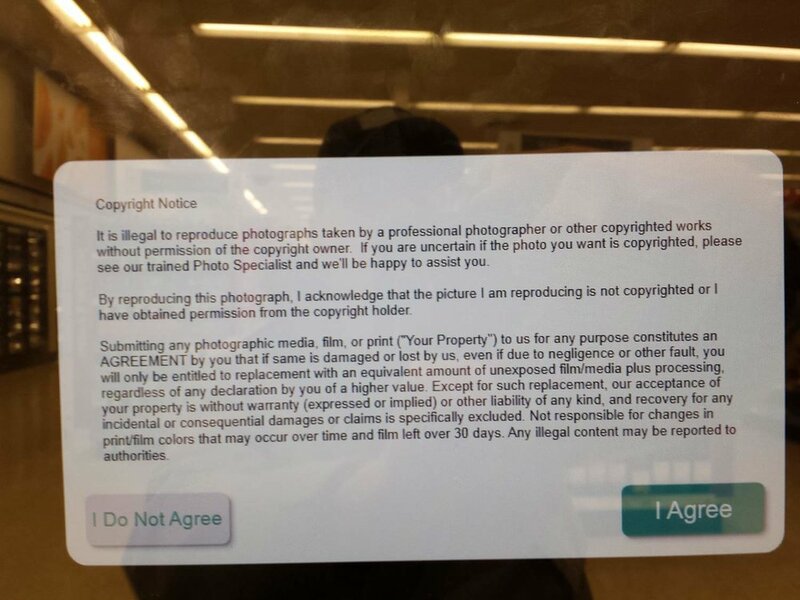 I came across this sad but true story where Walmart would not print images uploaded to their photo website because they looked Too Professional. Average consumers are unaware of this. Click here to see the post. Do your teenage kids tell you it is ok to copy music and movies and give them to a friend or other family members? Using your computer or smartphone it is so easy to just copy and print nowadays. So what is the big deal? The short answer: is that it is illegal to copy, post online or print copyrighted work without written permission from the copyright owner. For example: if the lab sees a copyright symbol on the image or if it appears to be created in front of a photo background they might assume it is professional work and require a written release before allowing the customer to have the printed photos. Yet, any photo that looks too good to be done by a non-professional could be flagged. As lab people have seen enough amateur work versus pro work to know the difference. Yea, but I've had a pro photographer's digital files printed at store "x" and did not get turned away? That is possible. A lot of local stores that make photos do not check for professional looking work. BUT YOU STILL HAVE TO SIGN THAT YOU ARE THE COPYRIGHT OWNER OR HAVE A RELEASE! NOT HAVING EITHER OPENS ONE UP TO POSSIBLE LEGAL RAMIFICATIONS! Most local store labs have you use their Kiosk (photo station). And one of the first statements that come up is about copyright. In order to continue you must check the box, or agree, stating you own the copyright or have a release from the photographer that did the work. Checking the box is the same as signing a legal document! The same applies if you bypass your local store and decide to upload images using an online service. Somewhere in the fine print you are agreeing that you own the content or have a release. This information is kept on file. OK, then if I hire a photographer to take my portrait and I buy the digital files then don't I own the copyright? Nope! The photographer does. And along with the digital files they sell you they should also give you a release which is better known as a license. This gives you legal permission to use the file depending on what the written requirements in the document were. That is why when you take a picture of someone with your camera or smartphone you become the copyright owner and the lab can print your digital files with no problem. You don't even have to apply to the copyright office. It is just a fact. If I have a written license then am I safe to do what I want with the files? Speaking for my own business, It all depends on the license type and what rights the license grants based on what you want to do with the files? Do you only want to post them on Facebook or your personal website? Or do you want to print them yourself? And if you wanted to use the file(s) in a magazine then you would require more rights. There is no one license that fits all. They have different pricing structures for good reason. Did you know a professional photographer's digital files can be tracked if put online? Pros can create a digital watermark in their sold digital files. It is not the same as printing on the actual image surface. Which is a standard watermark that shows their name and copyright symbol. Rather they can embed copyright text information hidden from sight in the files metadata. Which also describes how the file is allowed to be used. There are services that use spiders and search robots to crawl the web and can find where these images are posted. So make sure you obtain a written release from a professional photographer when sharing, printing or posting their files! That way you won't get held back and will have the right to do what you want with the files, within the legal framework of the license. Our Recommendation on the best way to archive your photos: How to archive your digital files.